This Genius Series Puzzle is for school going Teens. It will test your Maths and Logical Reasoning Skills. In this Series Puzzle, your challenge is to study the pattern in the given series numbers and then find the next number in the series. Can you tell what will come next which replaces question mark? Can you tell what will come next in this series? 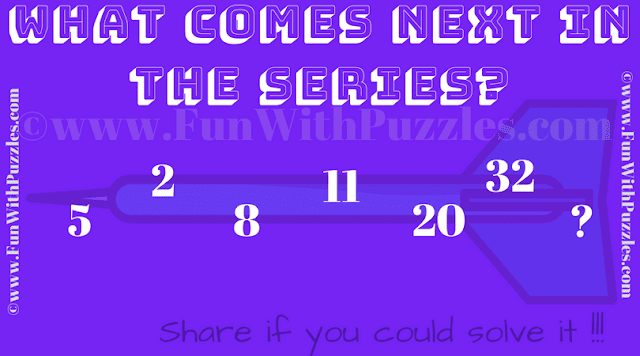 Answer of this "Genius Puzzle Series", can be viewed by clicking on answer button. Please do give your best try before looking at the answer. First two numbers in this series are starting random numbers. Other than these any number in the series can be obtained by added previous two number and adding 1 to the sum obtained.